Zasio provides agile, innovative technology solutions and consulting services to help businesses of all sizes build and maintain a successful Information Governance program—guiding them through information governance’s toughest challenges. We believe information governance does not need to be complicated. We solve problems, collaborate and analyze ways to provide exceptional customer experiences with our technology, consulting and world-class support solutions. At the core, we exist to help our customers manage and protect their information. We specialize in managing records of all types, including electronic and physical legacy files. We’ve done everything from data mapping to international retention schedules, navigating businesses through the less-than-intuitive world of information governance. And we’ve provided tools and acted as consultants for 1,000 clients and counting. With this, we have grown Zasio into the standard by which other records management companies are measured. We offer complete retention management and research tools. With over 100,000 U.S. domestic and international records retention, handling, and format requirements, we have the most robust solutions on the market. We offer solution-based guidance on enterprise pain points. From records and information management to technology strategies and compliance support, we have experts to help. We take record keeping and handling laws seriously. In fact, we have an entire team dedicated to performing both domestic and international research. Law is constantly evolving, and so are we. Before the rise of electronic records management, information governance meant little more than keeping paper records—from accounting files to business transactions—organized in folders, drawers, boxes, and record centers. But electronic records have changed the game. Not only does information grow faster than paper, but it’s riskier. All it takes is a simple copy and paste to lose control of your information. Not to mention the cost of eDiscovery in the event of litigation. You need a solution to manage information at every level to control costs and keep your business secure. Our journey into records management began in the Silicon Valley in 1987. Even back then, we could clearly see the need for a more versatile records management software. There were records management programs available, but none could manage the full life cycle. No existing software was taking a record from the time it was created all the way to its storage phase and eventual destruction. Zasio launches Versatile for DOS. It’s the world’s first records management software system to manage both active and inactive records. Zasio relocates its headquarters from San Jose, California to Boise, Idaho. Zasio creates its Records Management Consulting Division to provide clients with a complete solution: software and high-level expertise. Zasio launches Versatile for WindowsTM. Zasio breaks with Donald Skupsky to launch Versatile RetentionTM. The program is designed to assist customers in developing legally compliant records retention schedules and policies. Zasio launches Versatile EnterpriseTM, a powerful records and information management solution for managing the complete life cycle of a record. Zasio expands its Versatile software line with Versatile ExpressTM, an affordable entry-level records management solution. Versatile Enterprise achieves DoD 5015.2 Certification. It officially meets the standards for the design of an electronic records management software application. Zasio launches Versatile Professional. It’s powerful, easy-to-use software that’s designed to simplify and improve digital and legacy records tracking for small to mid-size businesses. 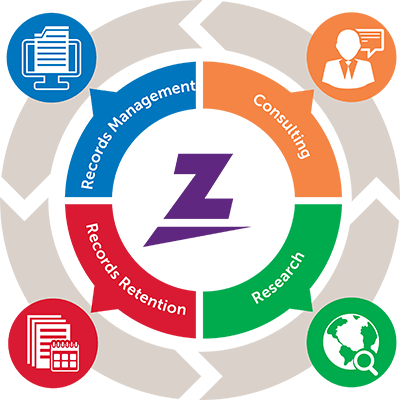 Zasio launches the Versatile Electronic Records Management SystemTM (ERMS), which seamlessly applies the power of Versatile Enterprise’s physical records management to electronic records management. Zasio launches Versatile Retention InternationalTM. International legal research and retention scheduling software and consulting services are now in one integrated package. Zasio formalizes its Legal Research Division, which is dedicated exclusively to researching citations worldwide. Zasio completes research on over 100,000 domestic and international citations. Zasio celebrates 30 years in records and information management. For over 30 years, Zasio has been at the forefront of records management and information governance. As global leaders in information governance, we want to help businesses create, implement, and maintain a bulletproof IG program. Whether you’re currently running an IG program or just getting started in records management, our team has the expert guidance you need.